The voices that try to drown out all sense of reason and perspective. 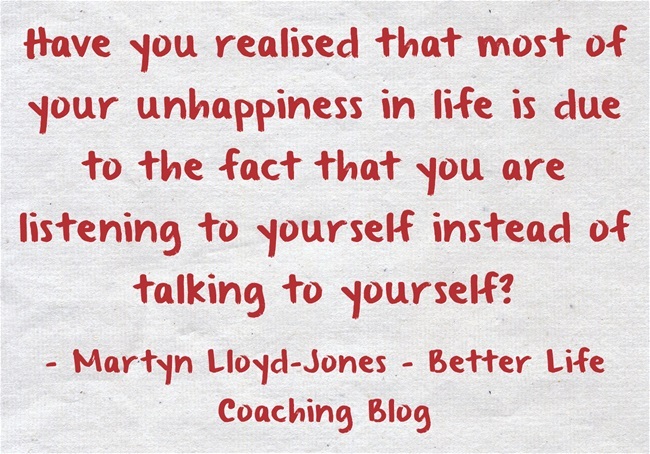 Stop listening to yourself and start talking to yourself instead. Tell yourself that you are OK.
Tell yourself that you are not your past. Tell yourself that today is a blessing and the future is full of opportunities. Tell yourself until you can’t hear the voices any more. I have always thought that talking to yourself is not good, since people might think that you’re having a disorder or something. But after taking some time and talking to other communication students, I then realized that there’s this type of communication called Intrapersonal. And this one is healthy in maintaining the balance in your life. Personal development is the key to success! Very nice post sir..Kudose 2 u…Thank u so much.